President Obama greets young Americans and looks to his plans for the country’s future. I’m glad Stafford loan rates were kept low but so many Higher Ed issues aren’t being addressed, such as Why are interest rates on federal college loans so high, (e.g., the Direct PLUS Loan for Parents, etc.) despite interest rates being at record lows? And why, except in cases of extreme hardship, is it that private and federal college loans can’t be discharged in bankruptcy, whereas just about every other type of debt can be? How would you remedy these inequalities? If elected, what difference would high school and college age students see in the cost and affordability of a college education? — A combination of questions submitted by Jon D., 29 from NY, and Nikki R., 23, FL. What contribution would you most like to make to the world before you would leave the office of President? — Question submitted by a group of students from MA: Derek, 18, Stacey, 17, Tynisha, 18, Shaquille, 17, and Demetrius 16. The unemployment rate of Millennials is 12%. This is a huge issue for us young Americans and doesn’t seem to be ringing any real alarm bells. It’s a whole generation that wants work, but can’t find it. What is the master plan to change the prospects for people like me? — Question submitted by J.D., 26, from NJ. It has become more difficult for poor students to get a Pell grant. What is the future of Pell grants with you as President? — Question submitted by Michelle M., 34 from CA. What are your plans to address the mounting federal debt in a way that enables our nation to meet the critical needs of vulnerable people with disabilities and their families? Do you support a balanced approach that includes both spending reductions and increased revenues? — Question submitted by Marian K., 25, from FL. President Obama summarizes his plans for the future of America’s youth. Much thanks to our nearly 100 debate partners, totaling centuries of wisdom and over 100 million in reach, for their myriad support ranging from technology and outreach to youth issue insights and voter education. They’re definitely one the largest and most-loved assemblies of those who care about the future of America’s youth. MICHAEL GEISEN (2008 National Teacher of the Year), and many others. Welcome to the 2012 Presidential Youth Debate! We’re a nonpartisan youth civic-engagement program that’s featured the participation of every President and major presidential candidate since 1996, and we’re grateful to now air exclusive online video of President Obama answering the questions young Americans say matter most, including unique concerns on higher education, jobs and the economy, and deficit reduction. “We support the Presidential Youth Debate and their efforts to share the candidates stances on the issues most important to young Americans,” Heather Smith, President, Rock the Vote. ABOUT THE PRESIDENTIAL YOUTH DEBATES: Using the participation criteria set forth by The Appleseed Citizens’ Task Force for Fair Debates, The Presidential Youth Debate works to get young Americans the candidate answers they need to vote for the future they want. Founded by Anthony Tedesco with participation from President Clinton and Senator Dole, The Presidential Youth Debate is a nonpartisan, youth civic-engagement and voter education program that’s provided an online forum between young Americans and every major presidential candidate since 1996 – who’ve all participated to answer the questions young Americans have submitted and chosen as most important. 2008′s Presidential Youth Debate reached 25 million young Americans and 100 million people of all ages through programming syndication. 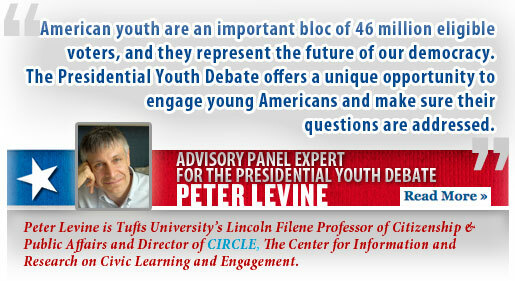 See http://www.youthdebate.org for archives of the 2004 and 2008 debates. ABOUT PORTABLE HEROES: The Presidential Youth Debates are produced by the Portable Heroes team, including founder/director Anthony Tedesco and EVP of Business Management John Cassidy, along with invaluable help from Senior Copywriter Jake Cooney, Technical Director Rod Weber, consultant Peter Saalfield, Associate Producer Kasey Harrington, In-School Director Sean Russell, and everyone at Open Minds, a consortium of educators from secondary schools, Harvard and MIT, that aims to help high school students examine ethical questions they face every day. 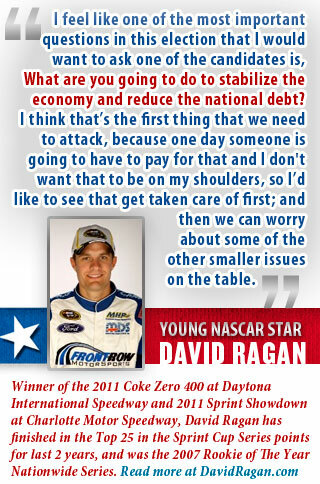 You can click to view the questions submitted and chosen as most important by young Americans. Constitutional Rights Foundation’s “Election Central 2012” provides a wide variety of readings and activities that provide historical background and raise issues about democracy and the electoral process in the United States and worldwide. MON. 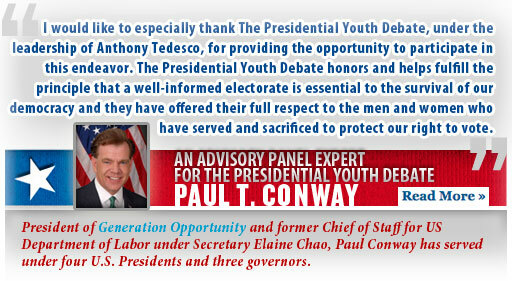 OCT 8TH: Thanks for all your questions for The 2012 Presidential Youth Debate! Even after four elections and tens of thousands of questions, we’ve still never before received so many from so many different partners and delivered in so many different ways! Today and during our week of pre-submissions we’ve received text messages and phone videos, faxes and site forms, emails from tablets and filled cardboard boxes from one of our many in-school partners (with much thanks for free Presidential Youth Debate lesson plans created by ThinkerAnalytix, a consortium of educators from secondary schools, Harvard and MIT, that aims to help high school students examine ethical questions they face every day). TUES. OCT 9TH: Thanks for all your votes! Young Americans have submitted and chosen the questions they most want answered in the Presidential Youth Debate. We’re still switching people from their usernames to their real names and real-life experiences of the question they’ve asked, but the questions themselves are already up! THURS. NOV 1ST: Candidates join the discussion through their exclusive HD video responses to the questions young Americans chose as most important in The Presidential Youth Debate.